This command is only present in EDAP Tools v.4.0.2 for Animate CC 2019 and newer and is hidden by default. To use it, users need to go to EDAPT Control Panel, click on the Manage Commands… button at the bottom and click on the checkmark for EDAPT Service Layers Renamer. After a restart of Animate, the command will appear in the Commands menu. It is also available as standalone to be used alongside any older version of EDAP Tools. Renames EDAP Tools' own service layers in two directions for compatibility with the new restrictive layer naming model, introduced by Adobe in Oct 2018 with Animate CC 2019. Renames EDAPT's own service layers (Magnet Target(s), Center Marker, etc.) 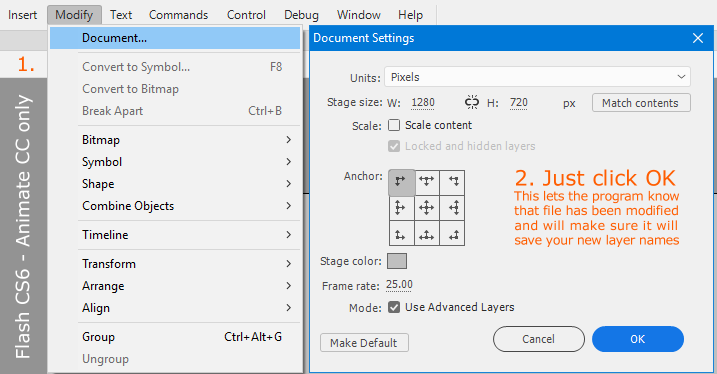 in existing older user files in order to conform to the more restrictive layer model, introduced by Adobe in Animate CC 2019 as part of the new Advanced Layers. This resolves functionality issues with Smart Magnet Rigs, Magnet Joints and so on, where EDAP Tools rely on specific naming of those service layers. Animate CC 2019 and newer. The command must be run once on each user file (FLA) created in versions of Flash / Animate older than CC 2019. This will restore full Smart Magnet Rig functionality as well as other features such as 'no key' and so on. When you open a file created in a previous version of Flash / Animate in Animate CC 2019 you will notice that Magnet Joints don't work. This is due to Magnet Target layers being named „Magnet Target(s)“ which is a layer name not compatible with Advanced Layers. If you switch Advanced Layers on for the file, Animate will automatically rename all your layers in accordance to Adobe's new model – only letters, numbers and underscores are allowed. To conform to the new strict rules we have made changes in EDAP Tools and this command provides you with an automatic way to convert your files in the newer format. Simply run EDAP Service Layers Renamer from the Commands menu and all EDAPT functionality for your file will be restored. You can then freely switch on or off Advanced Layers and Smart Magnet Rigs will not be affected by that. Problem: Due to a fast save optimization introduced by Adobe in CS6 and present in all CC versions, Animate will not save layer name changes unless you open each modified symbol, which drastically slows down the process. In the Document Settings dialog just click OK. This will let Animate know that the FLA file has been modified. After that when you save your file the program will be aware of the changes and not overlook them. It is always a good idea to save the modified file under a new name and keep the original as backup. If you'd like to use your CC 2019 file in older versions of Flash / Animate with older versions of EDAP Tools you have to run the reverse renaming from Strict to Relaxed model. You can do this either with the built in command or in your older version of Flash using the standalone version. The command is also available to download as standalone for those users who prefer to use older EDAPT packages and need to convert their files.